From April to October, the Tampa Bay Rays call Tropicana Field home. Magic happens here — like when the Rays overcame a seven-run deficit to the Yankees to win the final game of the season (in the 12th inning) and clinch the American League Wild Card spot in 2011. But what happens in January when the team is on break and the field is quiet? 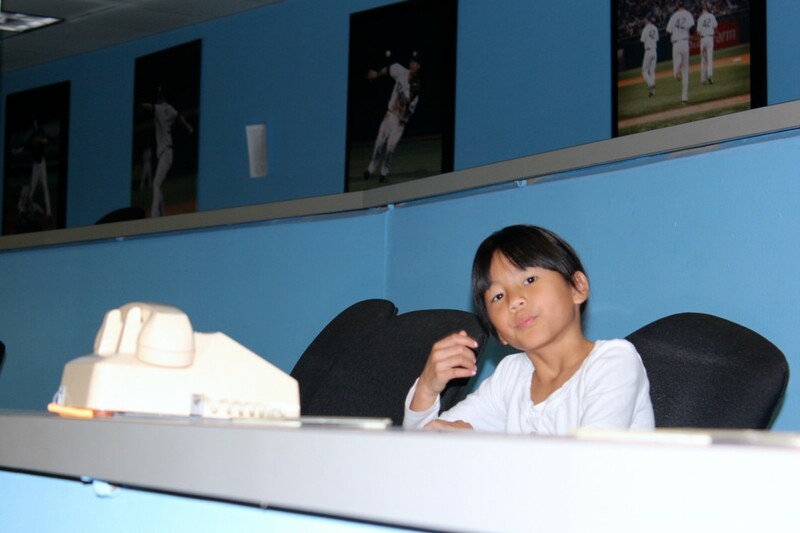 Lucky kids get a chance to sit in the press box and pretend they’re reporting on the game. Or they get to sit on home plate (or where home plate will be when the field isn’t being used for football bowl games). But don’t sit here when Evan Longoria is at bat! Or they get to run the bases… Notice the guys in the background, grunting, or whatever guys do when in a sports arena. 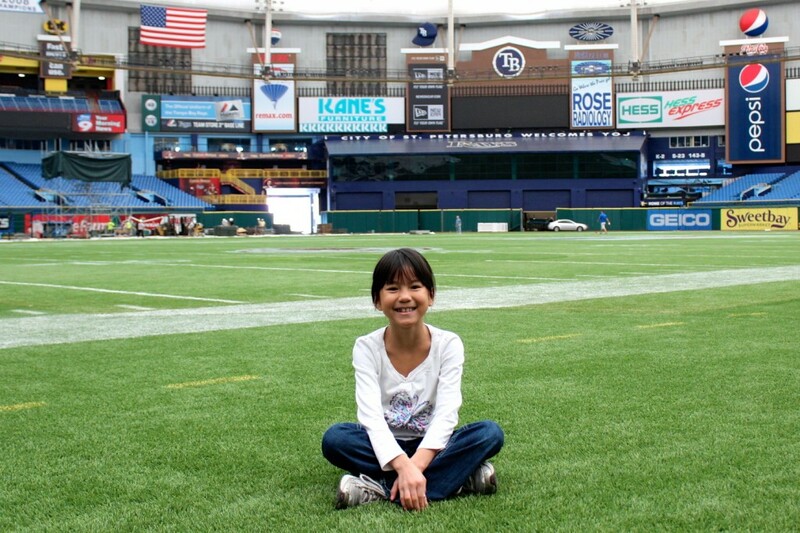 A long-time family friend works for the Rays and took us on this informal tour while when we were in the area. Thanks, David! We hope to get back to watch the real team play later this summer. I know Ellie would enjoy the “regular” kid fan stuff along Right Field Street, a ballpark dog, and some Cracker Jack! 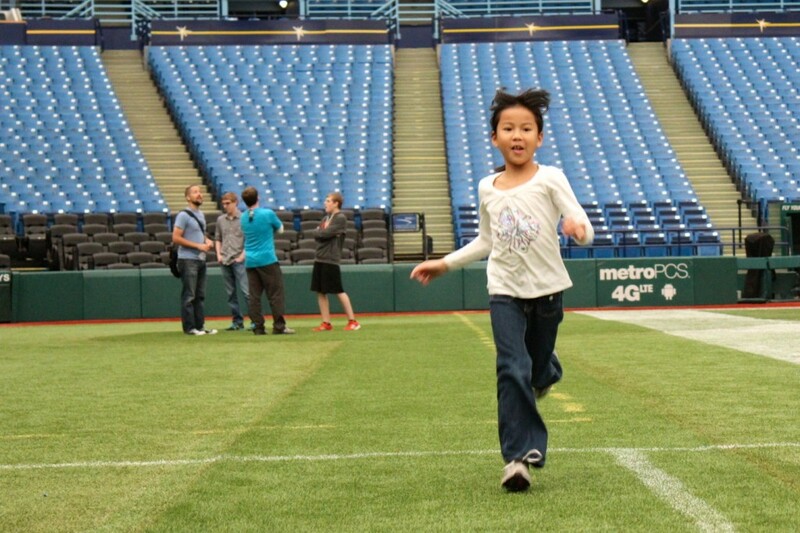 The Rays offer Tropicana Field tours to fans January through September. We highly recommend it! For tour information including cost and tour dates, click here. Share your travel photo at our Facebook Page and join in on the fun! You can also visit Budget Travelers Sandbox for Travel Photo Thursday, at Delicious Baby for Photo Friday and at “R We There Yet Mom” for Friday Daydreamin’ to see what other travel bloggers and photographers are sharing. I bet your girl enjoyed the special treatment and personal tour. That’s a huge grin on her face. 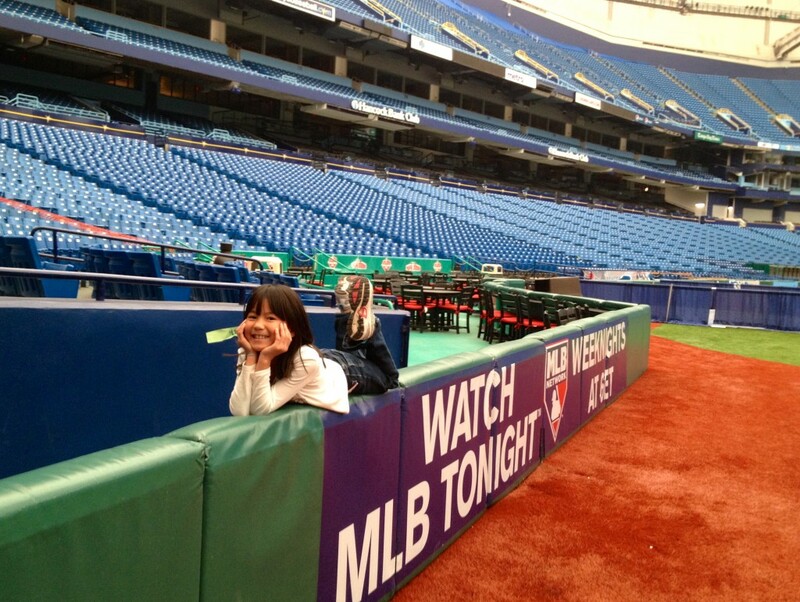 I’ve never understood why Tropicana Field isn’t a more popular family activity. It’s a way to escape the heat, there’s a bunch of stuff for the kids, and it’s a heck of a lot cheaper than Disney World! I’m right there with you. We love the throwback feel at the Trop, the cozy environment (not small, but definitely fan focused), and the fun. The team is there to play ball — leave the super-egos at the door. This is baseball the way it’s meant to be played. These are great pictures! What a wonderful opportunity to check out everything from behind the scenes! Looks like your little girl had a wonderful time. Great photos, but of course she is a real cutie so you had a great subject. How nice to have your friend let you enjoy Tropicana Field. Thanks for letting us enjoy it with you. I’m dropping by from Our Everyday Harvest’s blog hop. I hope you can stop by for a visit too. Looks like you guys had a blast and I’m sure she told all her friends about it! What a special treat. What fun! She is so cute and I love the comment about the guys. lol Such cool memories for her. What a fun day, and your daughter looks like she had a great time. Love the pics! So glad you guys got a tour! 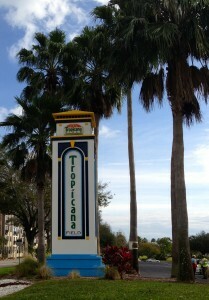 We love the “Trop” too! Great photos. Thanks so much for stopping by. Come back often! What a fun day! I especially love the diva picture! What a fun way to capture a memory. I love the idea of a girly girl shoot in a ball park. Great pics. She is so cute! Specially in that last pic! Its nice to see that baseball is still the American passtime! I think spring training in the minor league teams are the way to really enjoy baseball now days. The Rays really have a throwback field (and the lowest tickets in the majors), so it’s fun to watch the pros play there. We live in NC, home to the Rays’ farm team (Durham Bulls), which is also fun to watch!